Create Tangrams design online for a quirky but fun challenge. The classic Tangram puzzles online features 7 shapes in specific dimensions that form together to create a plethora of different shapes. Made from 0.2" thick felt printed with your own designs on one or both sides, this is a unique learning activity for adults and children alike. Choose from 2 sizes. 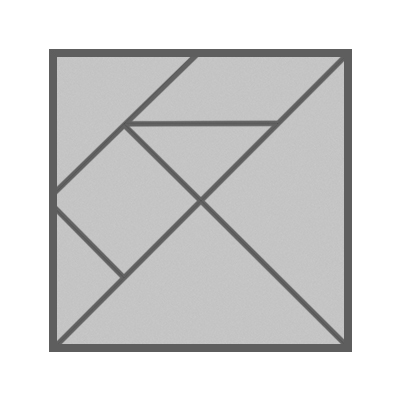 The tangrams design is an old dissection puzzle that originates from China, and is thought of as the earliest psychological test. Today, it's used as a fun educational puzzle as well as in mathematics. 7 shapes with specific dimensions fit together to form a perfect square, and are then rearranged in various ways to form the outlines of popular shapes, like a cat, dog, house, bird, candle, boat etc. Your bespoke tangram puzzles online come in 2 sizes and can be printed on one or both sides. When it comes to how to make tangram puzzles online, the mechanics of this ancient game is necessary. Yours is handmade in our studios using durable 0.2" thick felt cut into 7 specific shapes. The idea is that all all the shapes can be arranged to form a perfect square, so the measurements need to be precise. Your design is permanently printed using a specialist technique that fuses the ink deep into the fibers, ensuring the images don't fade, peel away or scratch off. Once the felt has been printed and cut, they're presented in a fabric drawstring pouch, enabling you to keep your tangrams design shapes together. Your tangram is made from soft but durable 0.2" thick felt, and can easily be surface wiped clean. Do not put in the washing machine. Within the design interface, you'll be able to see exactly where we cut the felt fabric, should you want to position elements of your design in specific places. The nature of a tangram puzzles is to rearrange the pieces in various different formats, so the position of your design shouldn't be too much of a concern. There's also the option to print on both sides, which is ideal if you have a design brand and need to include business details and your contact information. You could also print two very distinct designs to switch things up and create a different look. 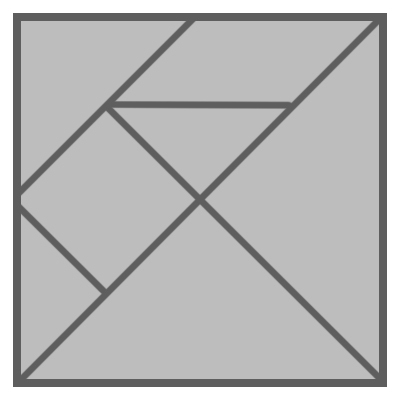 Create a tangrams design for your children to play with at home when there's no homework. As it's proven to help with spatial and visual problem solving, this is something that is both fun but also helpful with the cognitive learning. Print numbers, animals or a cute illustration as a way to engage them in this unique activity. If you're running an event and want to include some interactivity, a range of tangrams puzzles online could be a good way to keep guests entertained. As part of the breakout area, guests can grab a coffee, network and interact with the puzzle activity. Printed with your event logo, these games will help with brand recognition. Give this ancient game a refresh and printed a range of tangrams design with your original artwork. This is such a unique way for customers to appreciate and enjoy your art, and also lets them recreate your masterpieces in various different ways. Made from thick, soft, strong 0.2" felt with a permanent print. A tangrams design is an ancient Chinese dissection puzzle, whereby you move the 7 'tan' shapes to form the outline/silhouette of a single shape, like a dog, rabbit or boat, without the shapes overlapping. A tangram puzzle is suitable for all ages, and can be used to help cognitive functions such as spatial and visual problem solving. Due to the loose fabric pieces, we don't recommend for small children. How many shapes can I make? The opportunities are probably endless, however there's many classic shapes such as the shoe, cat, boat, rocket, dog, human, candle, chair, swan, tree, horse, fish, rabbit, house. snake, frog, teapot and more.